Numbers are easier to understand when you see them in tables. Many a plan to read the Bible from cover to cover has gone down for the count in the book of Numbers. Yes, it has census lists and tax lists, and these may have knocked you out in the past. Nevertheless, this book marks a turning point in the history of God’s people. When the book begins, they are whining and helpless babes in the faith. By the time it ends, they are a powerful people of faith, ready to inherit the Promised Land. You may remember that when Jacob went down to Egypt, the family numbered 70 persons (Genesis 46:27). When they left Egypt four hundred years later, the number of men age 20 and upward was 603,550. No doubt you have read commentaries that are skeptical of this enormous increase, but it looks okay to me, because I’ve done the calculation. With this many adult men, the total population would have been in the neighborhood of a few million. Let’s assume a doubling time of 25 years, very reasonable for a healthy population without growth restraints. The population every 25 years would be as follows: 70; 140; 280; 560; 1120; 2240; 4480; 8960; 17920; 35840; 71680; 143,360; 286,720; 573,440; 1,146,880; 2,293,760; and at 400 years, 4,587,520. Following one of John Wesley’s guidelines – that we should take scripture literally unless it implies an absurdity – I think we should take these numbers at face value. The children of Israel were an enormous crowd when they left Egypt! When I told Pastor Craig of my plan to read Numbers he replied, “Numbers it is….now count backward from 100…..you’re getting sleepy….sleepier…” However, I’m going to tabulate all the census and tax lists for you, and a few other lists as well, so we should have fun. Verses that aren’t tabulated are ones that you need to read for yourself. How would your church service go if the preacher, the staff, the choir, the acolytes, the musicians, the ushers, and the whole congregation of children and adults all showed up two minutes before church started and sat wherever they could find a chair, only to find that the pastor and the choir director had not yet agreed on what happens first? At St. John’s we have maybe 600 or 800 people present on Sunday morning. The ushers direct people to the sanctuary, the Son Shine Café, the Family Life Center, or the Sunday School rooms. The choir assembles and goes to assigned seats in the choir loft. Our organist sits at the organ, and the band goes to the stage. The preacher goes to the pulpit. The staff and volunteers take positions to carry out their assigned duties. The congregation sits in the pews. The service follows the order of worship in the bulletin. Everything works. The children of Israel, remember, numbered a few million. They too had certain places to be and certain times to be there. Everything worked. 17 Then the Tent of meeting is to go forward, with the tents of the Levites, in the middle of the armies; in the same order as their tents are placed, they are to go forward, every man under his flag. Certainly you have heard of priests and Levites. (Hebrew priests, not Catholic or Episcopal priests.) Moses and Aaron were descended from Levi, the son of Jacob. See the chart; Moses and Aaron are at the bottom near the left side. God chose Aaron’s family to be priests, and the rest of the Levi’s descendants to be, roughly, lay staff for the tabernacle (or “tent of meeting”). 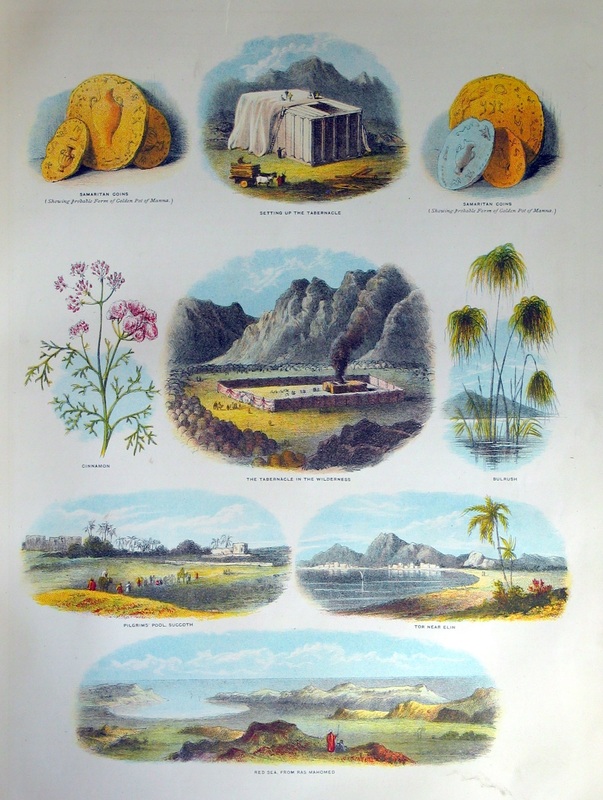 Each clan of the tribe had its own duties. Strictly speaking, Aaron’s descendants are also Levites, because they descend from Levi; however, normally “Levites” refers only to the non-priestly part of the family. You also remember that during the Plague of the Firstborn in Egypt, the LORD passed through Egypt and took every firstborn child or animal (Exodus 12). The Hebrews were warned in advance to put the blood of a lamb or young goat on their door jambs, and the angel passed over those houses. God took the reasonable position that thereafter, all the firstborn in Israel belonged to him. Firstborn animals had to be sacrificed or redeemed. Human children couldn’t very well be sacrificed, since God was against human sacrifice. In lieu of a system whereby a lot of unrelated firstborn children were separated from their families to work at the tabernacle, God took the tribe of Levi. 17 These were the sons of Levi by name: Gershon and Kohath and Merari. Reader Comment (12/22/2011): Your charts for this Book have been INVALUABLE! I just read part of Numbers without them and I have to say, it takes effort. Your charts/tables are perfect. You suppose you could publish a new Bible with those included? :) Thanks for the time you put in to make it easier for the rest of us! God first gave the Ten Commandments, and a whole lot of other commandments as well, to Moses back in Exodus 20 and the following chapters. Then in Chapter 32:19, Moses lost his temper over the matter of the golden calf, and the first set of tablets got broken. In Exodus 34 and the following chapters, God told Moses to get some replacement tablets, and God wrote out all the laws again. In Exodus 34:19-20, God said that every firstborn (male) child or herd animal belongs to God, but that a donkey colt or a son must be redeemed. By the time the children of Israel had set up the Tabernacle, God decided that the redemption price for all the firstborn sons and cattle collectively would be the tribe of Levi and its cattle. The male Levites one month old and over numbered 22,000 (see yesterday’s table), and the firstborn sons of all Israel numbered 22,273. Therefore the 273 extras still had to be redeemed at 5 shekels per capita. The five shekels per son was to be given to the priests; a shekel is about half an ounce. Although this passage does not specify whether the sons were redeemed with gold (see Genesis 24:22) or silver, a similar levy on men for the support of the Tabernacle (Exodus 30:15) was for silver shekels. In October 2011, half an ounce of silver is about $16. On our first date, my (preacher) husband and I went to see “Raiders of the Lost Ark.” Very scriptural movie. Not only did the ark itself look as much like the Biblical ark as is possible, given the descriptions we’ve got, but it was clearly a dangerous object, to be treated with extreme caution. In real life, all the other holy things in the Tabernacle were dangerous as well. The power of God is never to be taken lightly. Copyright 2011, 2012 by Regina L. Hunter. All rights reserved. 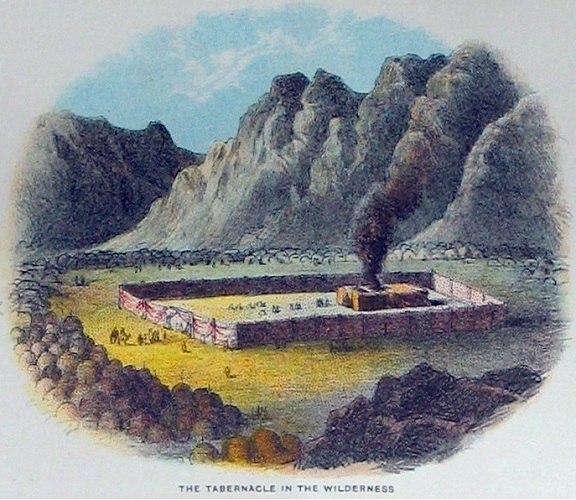 The illustration of the Tabernacle and the camp of the Israelites in the wilderness is from the Binns family Bible, now in the private collection of Regina Hunter.